Good news. I found two electrical outlets at McDonald’s. Wi-fi and electricty — sweet! Now I just have to battle the other library refugees for them. My new mobile office is thanks to a partnership between AT&T and McDonald’s. Thanks, guys. 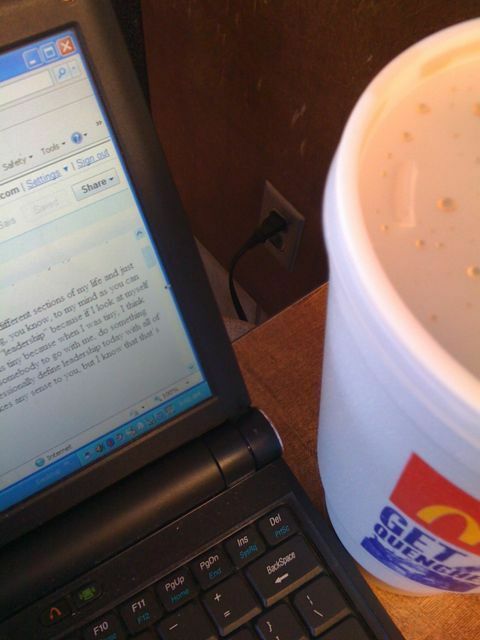 This entry was posted in digital moms, freelance writing, wi-fi and tagged AT&T, McDonald's, mobile office, wi-fi. Bookmark the permalink. AT&T was supposed to allow iPhones to tether to laptops, but they haven’t yet. That would allow you to take your office anywhere.